“Love Medicine” Coil Bracelet. $325. In some cultures, it’s a charm; in others, more literal medicine; in still others, something more elemental yet. It’s love medicine, an aid in the seeking of love, sought for its talismanic power and ability to inspire love in the object of one’s affections, or at least in one’s confidence to approach him or her. Here, Wings brings together elemental medicine motifs in a charm that assumes a spiraling shape and power. The coil is anchored at either end with earthy round onyx beads that flow into larger round beads of sardonyx, red and orange and brown and black and white marbled together like the elements and the winds all melding in a powerful storm. 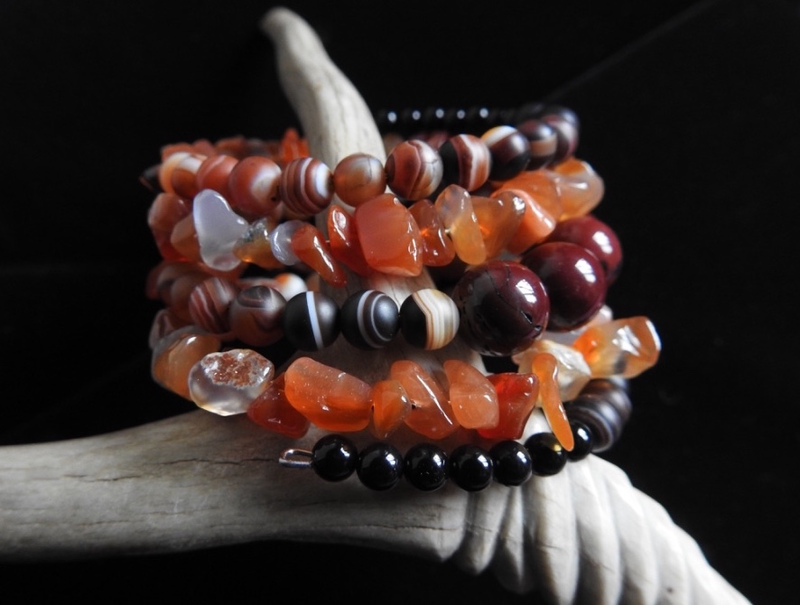 Bright orange carnelian in polished nuggety chips lead toward a second length of sardonyx, all leading to a center segment of seven large round beads of deep red jasper, each highly polished and aswirl in mysterious wisps of color. Beads are strung on memory wire, which expands and contracts to fit virtually any wrist. Jointly designed by Wings and Aji. All content, including photos and text, are copyright Wings and Aji, 2017; all rights reserved. Nothing herein may used or reproduced in any form without the express written permission of the owners. Posted on Sunday, March 12th, 2017 at 10:10 pm. Filed under: The Coiled Power Collections, The Love Collection, The Seventh Fire Series	RSS 2.0 feed.